From my Railfuture talk on Wider Wiltshire yesterday which included status updates for a number of current aspirations - ranging from improved and new services and through new stations and line improvements. In Wiltshire, I do not see any lines being (re)laid in the next few years. A Station formerly serving a village that survived the "Beeching Axe" against odds. It dropped to peak-only services at the low point, but now has a requirement for at least one train every 3 hours that makes the service a "curious and perverse" one as GWR struggle to meet the spec without stopping the only regular train on the line - the hourly regional express from Cardiff to Portsmouth. Odd trains call, daily commutes to any one destination are interesting, and there's a much better service to all destinations from nearby Westbury. However, nearby fields to the station are now covered in houses and Dilton Marsh has a significant catchment to service daily direct journeys to any reasonable pair of major work centres. GWR changes in December 2019 - relatively small adjustments based on major timetable upgrade. SWR - possibility / probability of extra services though the station from May, and some calling from (?) December. Would add some useful journeys to already-served destinations (timetable completion for some) as well as new journeys to places such as Basingstoke, London and Yeovil. 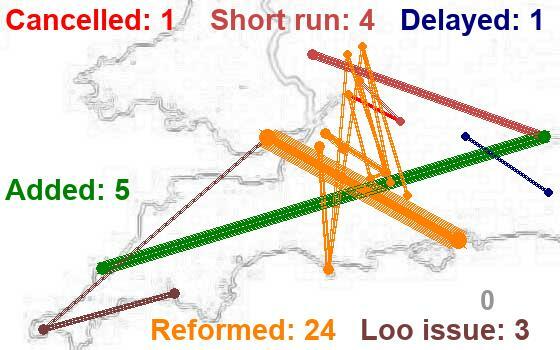 TransWilts / Severn and Solent proposals replace most of the current infrequent "curious and perverse" service with an hourly train on the Swindon to Southampton route; they leave a peak return services to Bath / Bristol. Audience reaction ... including a small number of local residents who had come along ... a pride in the station and a frustration at the current service that reduces their use to near-zero, driving to Westbury or Warminster. A further frustration that they don't know who to turn to / how to ask to get it improved. Wilton - from which WILTshire got its name. Population around 5,000. Large park and ride car park, underutilised, beside railway which heading out from Salisbury branches there towards Exeter (south west) and north north west across Wiltshire to Bath and Bristol. Wilton House and outlet village. Easiest rail access for buses to Stonehenge. Existing stations closed in 1955 (on Bristol line) and 1966 (on Exeter line). Note P&R prospects not just for Salisbury but for Southampton, Andover and London. Initial proposal for simple 2 platform station in cutting beside car park, funded by development of housing on the rise behind the car park. To be served by hourly TransWilts (Swindon - Southampton) service and SWR London - Bristol trains. Proposal extended to add footbridge over Exeter tracks to provide access to Wilton Town and attractions. 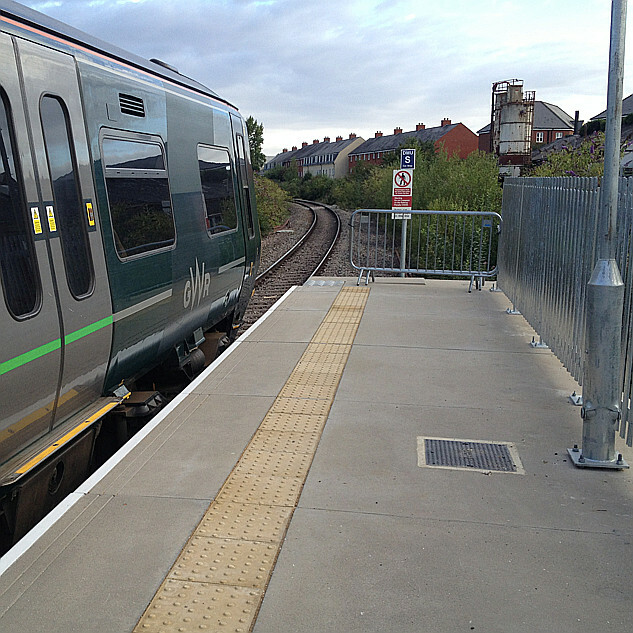 Proposal extended to add platforms on the Exeter tracks. The new station at Wilton Parkway is not a mandatory element of the Swindon - Southampton hourly train case; these trains have an excellent case even if they run through without stopping. Audience reaction ... from my personal comment added in speech about 'campaign drift' - proposal up from 2 platforms to 4, single ended bridge to double, 2 slopes to platforms up to at least 4 lifts and stair cases ... no direct answer, but a comment from the Wiltshire Council portfolio holder for transport that the station can't come soon enough because the park and ride as it stands was built by the DfT but has now been passed to the council for running and is loosing them a lot of money; lucky to find 40 spaces out of 400 occupied. Proposal to link .. Swindon to Westbury, Westbury to Warminster / Salisbury / Southampton, and Salisbury to Romsey via the Southampton loop. Efficient trains, new regional journeys in addition to serving all existing traffic. Would work - from December 2019 every 2 hours Swindon to Westbury and every hour south from there. No extra trains needed, but it would need cross-franchise agreements and co-operation which have, I'm pretty sure, been put on the "too difficult" pile as limited staff struggle to thread north-south services between the important east-west trains on their new schedules, at the same time sticking to what have - in some cases - become anachronisms in the service level commitments. Best look to see what can be done May or December 2020. Provision of hourly north of Westbury in peaks could be done; off peak, all day, clock face hits a capacity / robustness issue until works undertaken on the single line bottleneck. Audience reaction ... A well known local campaigner suggested this is in the hands of the DfT, as an option they could choose, based on a proposal made by GWR and SWR. Andrew Ardley in his talk to SERUG mentioned Wilton Parkway in relation to the WoE line, suggesting that they were looking at a station serving both lines. He also mentioned a meeting concerning the TransWilts, which I took to mean that a Swindon-Solent service was being looked at.